Photo courtesy of Rick Edelman/Rick Edelman Photography Mercer Island point guard Kailee Yan, right, scored 17 points against the Redmond Mustangs on Jan. 20. The Mercer Island girls basketball team remained perfect in KingCo 3A league play on the hardwood with an impressive performance against the Redmond Mustangs. The Islanders, who had three different players score in double figures, cruised to a 62-49 win against Redmond on Jan. 20 at Mercer Island High School. 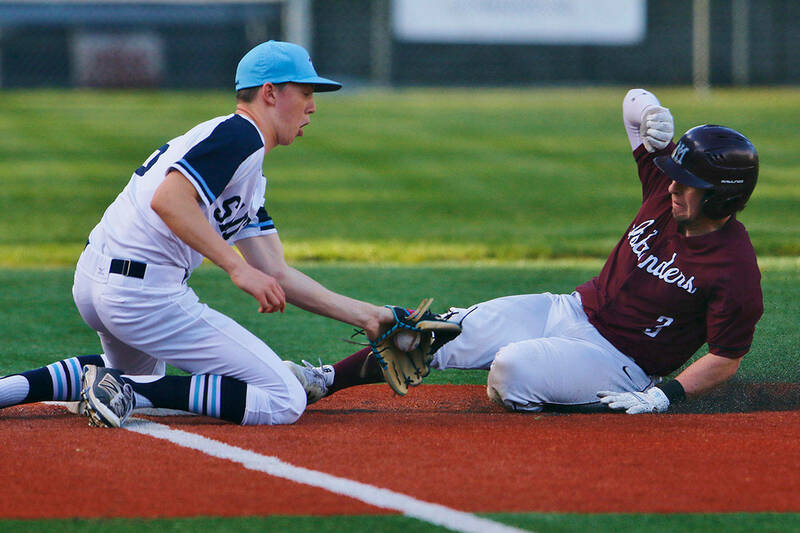 Mercer Island improved to 13-3 (11-0 league) with the victory while Redmond dropped to 9-7 (6-4 league). Mercer Island senior post player Anna Luce scored a game-high 24 points in the win. Islanders’ point guard Kailee Yan added 17 points and junior sharpshooter Jessie Stenberg added 12 points as well. Stenberg, who hit four 3-pointers in the second quarter, capitalized on Redmond’s focus on Luce in the second quarter. “I just got the ball and went for it. I was open. It was really good passes from my teammates so I thought why not go for it,” Stenberg said. Mercer Island head coach Gillian d’Hondt was thrilled to see Luce, Stenberg and Yan score in double figures. “It is always the goal to have everybody be a threat. We know teams are going to try to take her (Luce) away so everybody needs to come in with confidence. Jessie definitely did that for us tonight,” d’Hondt said. Redmond, who trailed by 17 points early in the fourth quarter, cut Mercer Island’s lead to 10 points on a Kiki Milloy basket with 1:09 left in regulation. Redmond head coach Ashley Graham was proud of her team’s effort despite the loss. “We worked hard but we dug ourselves too big of a hole to come back from. Mercer Island is a good team. They are aggressive, they are physical and they work hard. Hopefully if we get another chance (playoffs) we can compete a little bit stronger,” Graham said. The Mustangs are currently in fourth place in the KingCo 3A division. They trail the Juanita Rebels (7-4 league) by just a half game in the standings. “We still got four games to go. It is hard to say how it is going to pan out. It is important to be in one of the top three positions because then it is a much easier road. We will compete and see what happens,” Graham said. Stenberg said one of the goals the Islanders set in November was to win the KingCo 3A regular season title. “We just have a few more games to win. We’re currently in first place. We’re hoping to achieve that. We have great team chemistry and we always have. It has just been a really fun season,” Stenberg said. The Mercer Island coach concurred with Stenberg’s sentiment. “11-0 feels really good. We still have a lot of work to do to prepare for the playoffs. Rebounding is obviously something we need to work on. We have one post player (Luce) on the entire team so that is part of it. We will continue to work on that in practice,” d’Hondt said.